Representatives from British and Irish universities, and organisations such as the Bumblebee Conservation Trust, Buglife, the Natural History Museum, the RSPB, the Wildlife Trusts and the Centre for Ecology and Hydrology, will take part in a day of talks and discussions by leading experts on bumblebees, the UK’s most important pollinating insects. Talks will focus on the diversity and distribution of these bees, as well as their behaviour and conservation, their role as pollinators, and the ecological effects of pesticides. The meeting is being sponsored by Opticron Binoculars and the Nene Valley Nature Improvement Area project. Every two years the Bumblebee Working Group meeting brings together some of the top specialists in this most important group of bees. It’s an opportunity for discussion and debate about important issues relating to how best to conserve these fascinating and economically vital insects. For more information, please contact jeff.ollerton@northampton.ac.uk. 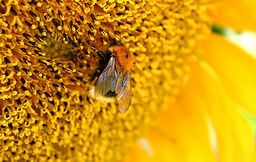 Posted on March 26, 2013, in Events, News, School of Science and Technology and tagged bees, ecology, Events, Jeff Ollerton, pollination, School of Science and Technology. Bookmark the permalink. Leave a comment.